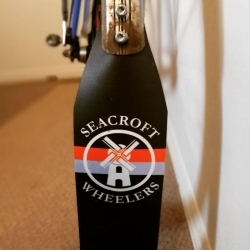 We’ve got some Seacroft Wheelers branded TopFlap mudflaps (http://www.topflaps.co.uk/) created for sale to members at the subsidised price of £5 or £5.75 posted. 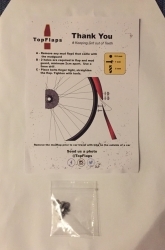 The flaps are printed on both sides and are approx 29cm long by 19cm wide, for use with varying length rear guards, so can be cut to desired size and intended to reach almost down to road level. They can replace your missing or damaged flap or added to provide more protection for the people behind you. The flap comes with fixings and instructions. Promote the Club and keep the grit out of peoples mouths! The price is great value as they are generally sold for £8 to £12. 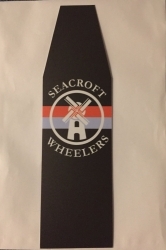 To purchase one send an email to shop@seacroftwheelers.co.uk with your contact details, how you want to pay (cheque or bank transfer) and whether you want to collect (from Oakwood, Leeds) or have it posted out (in which case please include your address).